is the inverse of A. A matrix A is nonsingular if A-1 exists (i.e., if A has an inverse). If a matrix does not have an inverse, then it is singular. This system can be expressed as an augmented matrix. Recall that an augmented matrix includes the constant coefficients of a system of equations. The solution to this system will provide the elements of M -1. 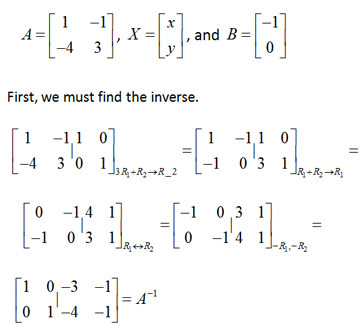 Find the inverse of N using a system of four equations in four unknowns. Is the identity matrix singular or nonsingular? using elementary row operations and matrix inverses. using elementary row orations and matrix inverses. Is it possible to solve a system composed of less unknowns than equations using elementary row operations and the matrix inverse? No elementary row operations are required to transform In into In, so In-1=In. Since In has an inverse, it is nonsingular. 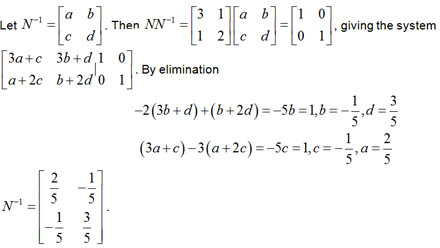 Yes, but the extraneous equations must be eliminated so that the coefficient matrix is square (having the same number of equations as unknowns).